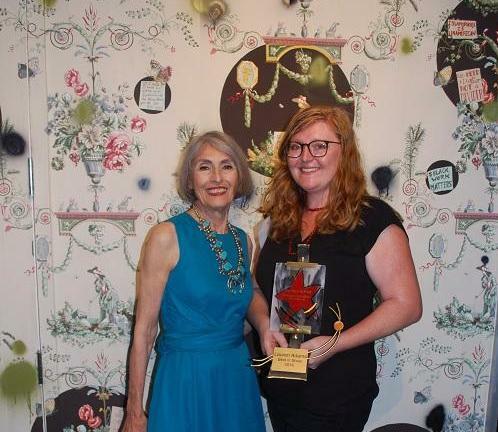 The Trawick Prize: Bethesda Contemporary Art Awards, a juried art competition produced by the Bethesda Arts & Entertainment District, announced the top three prize winners last night during the exhibition’s opening. Lauren Adams from Baltimore, MD was awarded “Best in Show” with $10,000; Sarah Irvin from Springfield, VA was named second place and given $2,000; and Ben Marcin from Baltimore, MD was bestowed third place and received $1,000. Lauren Adams, who earned her Bachelor of Fine Arts from the University of North Carolina and her Master of Fine Arts from Carnegie Mellon University, mines the histories of power, labor and material culture to make surprising connections that resonate with current sociopolitical issues. Her work has been featured at ConnerSmith in Washington, D.C., The Walters Art Museum in Baltimore, MD, Contemporary Applied Arts in London, UK, Contemporary Art Museum in St. Louis, MO and the Mattress Factory in Pittsburgh, PA, among others. She attended the Skowhegan School of Painting and Sculpture and held residencies at the Cite in Paris, France and the Jentel Foundation in Wyoming. She received the Joan Mitchell Foundation MFA Award in 2007, was a finalist for the Janet and Walter Sondheim Prize in 2014, and was recently named a 2016 Pollock Krasner Foundation grant recipient. The work of the finalists will be on exhibit at Gallery B, 7700 Wisconsin Avenue, Suite E, until September 24. The public opening reception will be held Friday, September 9 from 6-8pm. Gallery hours for the duration of the exhibit are Wednesday through Saturday, 12 – 6pm. Entries were juried by Stéphane Aquin, Chief Curator, Hirshhorn Museum and Sculpture Garden; Hasan Elahi, Associate Professor, Department of Art at University of Maryland and Rebecca Schoenthal, Curator of Exhibitions and Co-Interim Director at The Fralin Museum of Art at the University of Virginia. The Trawick Prize was established in 2003 by Carol Trawick, a longtime community activist in downtown Bethesda. She is the past Chair of both the Bethesda Arts & Entertainment District and Bethesda Urban Partnership, and also the Founder of the Bethesda Painting Awards. In 2007, Ms. Trawick founded the Jim and Carol Trawick Foundation to assist health and human services and arts non-profits in Montgomery County. The Trawick Prize is one of the first regional competitions and largest prizes to annually honor visual artists. To date, The Trawick Prize has awarded $205,000 in prize monies and has exhibited the work of more than 130 regional artists. Previous Best in Show recipients include Richard Cleaver, 2003; David Page, 2004; Jiha Moon, 2005; James Rieck, 2006; Jo Smail, 2007; Maggie Michael, 2008; Rene Trevino, 2009; Sara Pomerance, 2010; Mia Feuer, 2011; Lillian Bayley Hoover, 2012; Gary Kachadourian, 2013; Neil Feather, 2014 and Jonathan Monaghan, 2015.